"Better Together" - Part 4: "Nothing is Real"
The Trinity appear on the shores of Themyscira, but by now they know everything they see and hear is false. The Amazons are quick to intercept them and capture the trio, though Diana's younger self steps in before they are killed. In the real world Lois drives the pickup into the barn knocking Poison Ivy over. Lois tends to Jon and sees Clark, Bruce and Diana captive with Mercy flowers wrapped around them. Unfortunately for Lois Ivy recovers quickly and knocks out the fiery reporter. 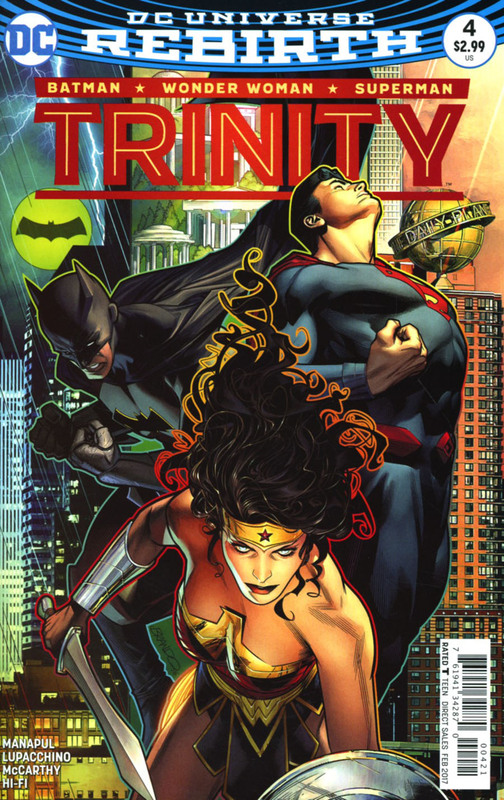 The Trinity are forced to participate in games for the Amazon's entertainment. But after they win each challenge Hippolyta halts the games and accepts them and Diana as a guest but the men must be banished to 'the dark quarters'. Diana refuses to abandon them and must share their fate. Much to the Amazon's shock the young Diana jumps aboard the raft they were banished on. A giant sea snake attacks them and Superman's powers cease to function. The young Diana advises them to embrace nature and allow the snake to take them to the next step in their journey. As the snake stops moving the young Diana vanishes and the Trinity find themselves inside the snake with only the lasso to light the way. As the heroes maneuver they spot Diana's sword and she uses it to cut the giant snake open. Instead of freedom the Trinity are greeted by Mongul and his young daughter and they are now at his mercy! Story - 4: Perhaps getting a little overlong now... After experiencing Clark and Bruce's fantasy worlds it was pretty obvious that this would be the next step. There isn't the emotional gravitas that was present in the previous chapters and that is a shame as she has as equal a tumultuous history as her male counterparts. I like the Lois sequence but wish it was more significantly featured as I think perhaps she might be the only one that can help save the Trinity from their fantasies. This new daughter of Mongul's is much younger than Mongal, Joshi or Mongul II. Is she a new child comparative in age to Jon or a reinterpretation? My curiosity is piqued. Art - 5: Lupacchino's art is really enhanced by showcasing Wonder Woman. The young Diana looks so innocent and Diana as an adult retains a regal quality. There is also a sort of animated styling to the artwork that somehow just... works, feels natural and is visually appealing. There is some beautiful pencil work here! 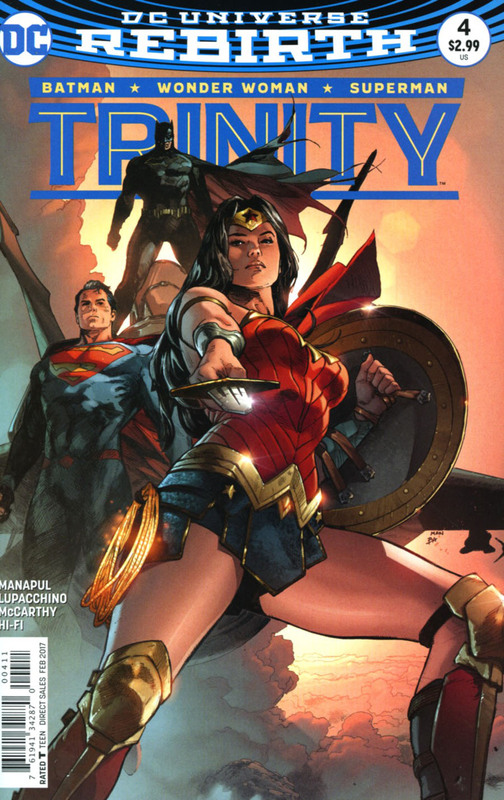 Cover Art - 5: Much like the chapters past, each issue has had a rotating focus on one of the Trinity and this issue Diana takes centre stage. She looks stunning but not salacious. Superman retains a majesty about him while Bruce his menacing darkness. Variant Cover Art - 3: Another showcase of Diana but while she looks fantastic both Superman and Batman are in the most awkward poses and thus the cover montage comes off as bizarre.